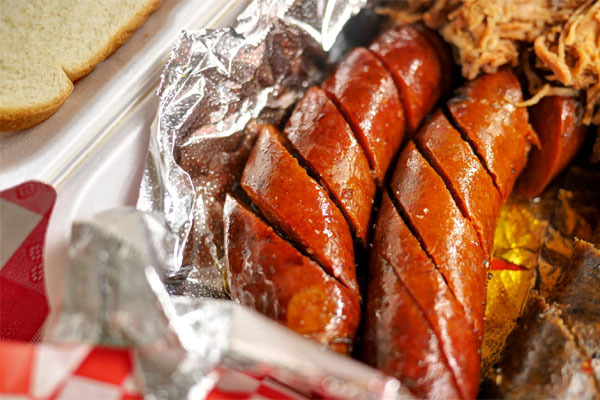 One of LA's lesser known, but still top-notch barbecue places is Robert Earl's, a Texas-influenced joint that debuted in August 2013. Powered by a four-barrel smoker in the back, the restaurant is the work, unsurprisingly, of one Robert Earl, an LA native who grew up in nearby Carson (though his family has Southern roots). 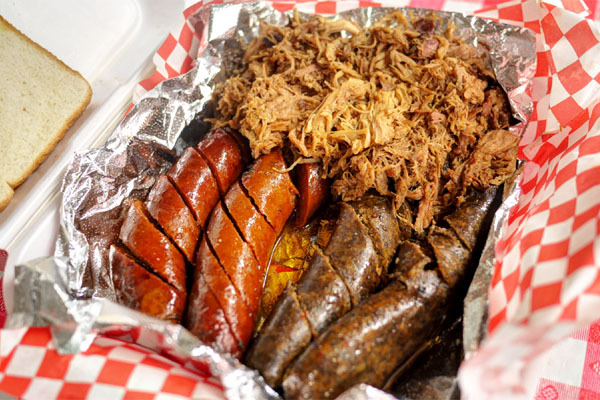 He learned to barbecue from his grandfather back in the day, and while working as a telecom tech, started an underground BBQ catering business from his Northtown Long Beach backyard. 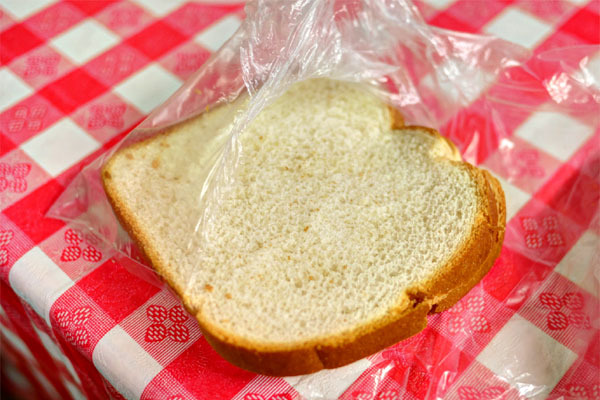 Earl stayed under the radar for over 20 years, but in summer 2012, debuted his cooking at the Greener Good Farmers Market, which eventually led to the permanent brick-and-mortar operation that we see today. 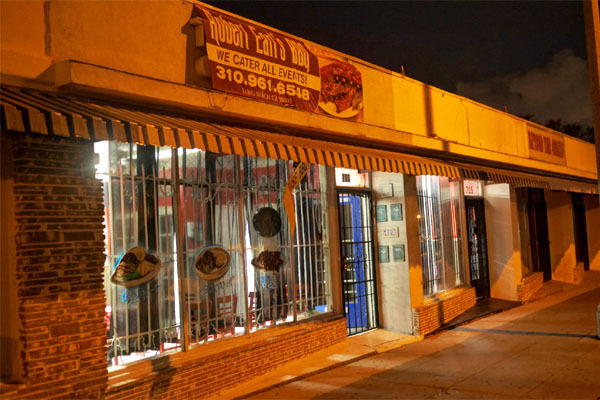 Customers place their orders in the window further from the entrance, and pick up their food from the other cubbyhole. The menu board looks slightly intimidating, but is really just composed of variations of your traditional meats and homemade sides (all vegetarian). Click for a larger version. Food in hand, you then walk over to the adjoining dining room with its checkerboard-topped tables, recently revamped in July. Given the limited beverage selection, we brought along some beers, and really, the BBQ calls for it. 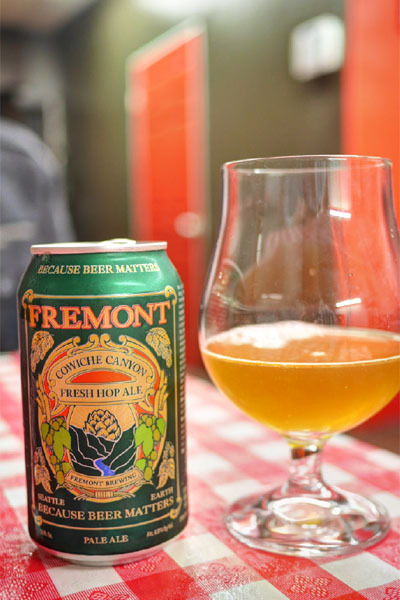 I got things going with something light, the 2014 Fremont Brewing Cowiche Canyon Organic Fresh Hop Ale. Made once a year, this was brewed with fresh Yakima Valley Citra and Simcoe hops and was pretty spectacular, with a super fresh, hoppy, tropical aroma and a super balanced taste profile that commingled bitterness with a great finish of grapefruit. 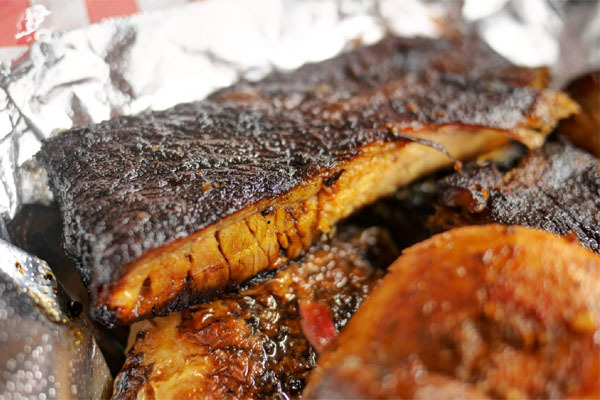 Most diners will probably want to get some sort of combo, and here we went with a couple of the three-meat variety, the first featuring Brisket, BBQ Chicken, and Spare Ribs. It was a pretty good chunk of meat for $20, and you can't forget about the included sides either: Potato Salad and Coleslaw. 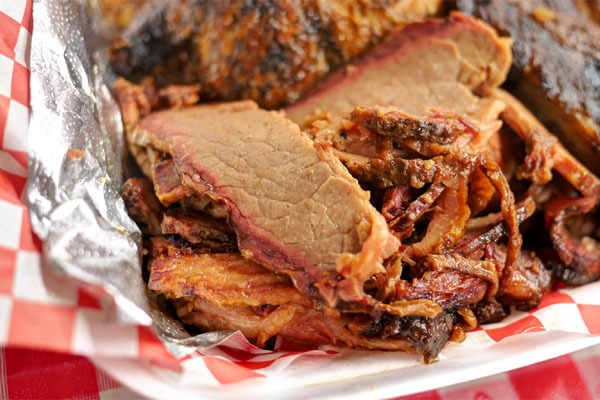 The brisket was more tender than most, and also appropriately juicy, with a satisfying beefy savor to it, though I would've liked a tad more smokiness in the mix. 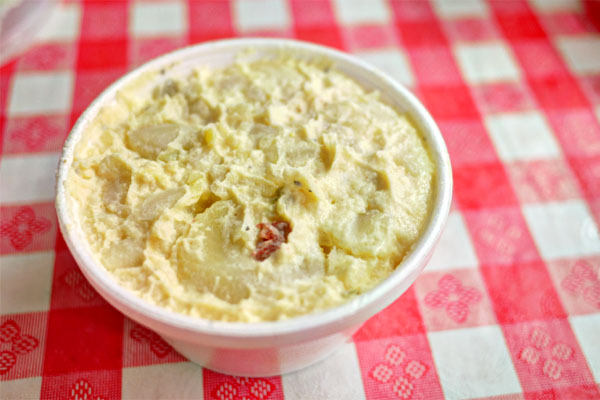 Potato salad worked well enough, but it could've been creamier, with some more acidity and crunch. 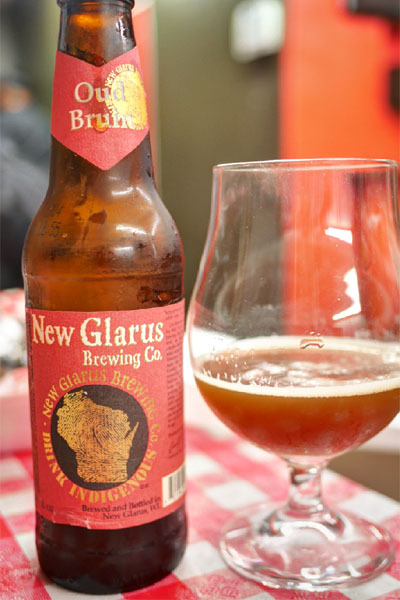 Sour duties were handled by the New Glarus Thumbprint Oud Bruin. It wasn't too acerbic though, tasting tart-ish and fruity, with a backbone of malt and a bit of oakiness in there too. Classic and easy-drinking. 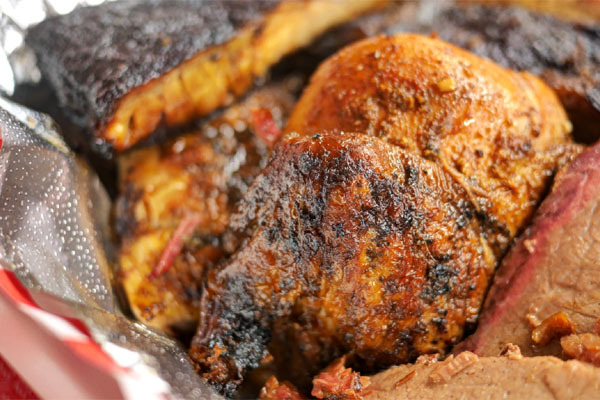 The barbeque chicken was a standout, one of the tastiest BBQ renditions of the bird I've had in fact, coming out super juicy, tender, and teeming with smoky goodness. 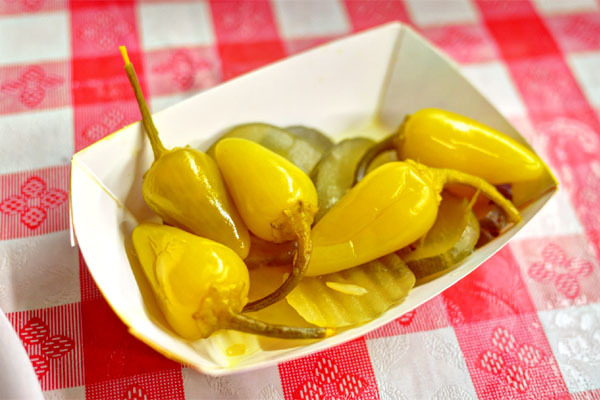 Accompaniments include a plate of (surprisingly hot) pickles & peppers, as well as those slices of white bread. 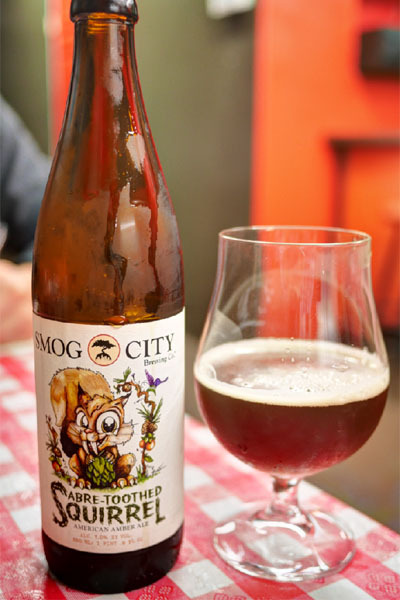 The 2014 Smog City Saber Toothed Squirrel was a new release from the brewery, and was quite a bit better than I expected. An American amber ale, this one smelled super hoppy and finished bitter, but I appreciated the maltiness on the palate to even things out. Pork spare ribs were tasty: smoky and savory and not too sweet, with nice charring, which I appreciate. They were on point texturally as well, showing off a great interplay of fat and char. Along with the brisket, this was one of the meats that Chef Earl first started out with. 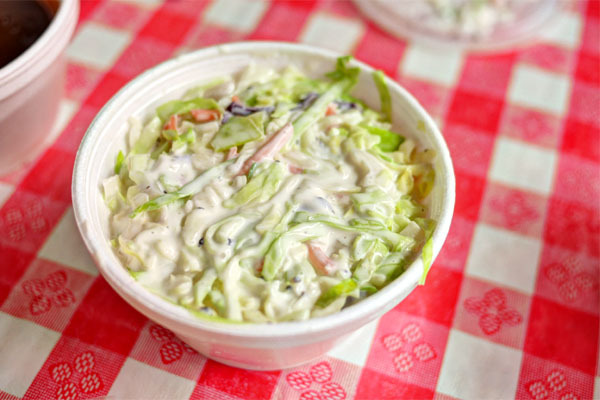 The slaw was to my liking, coming out creamy yet crunchy, with a peppery bite to it. 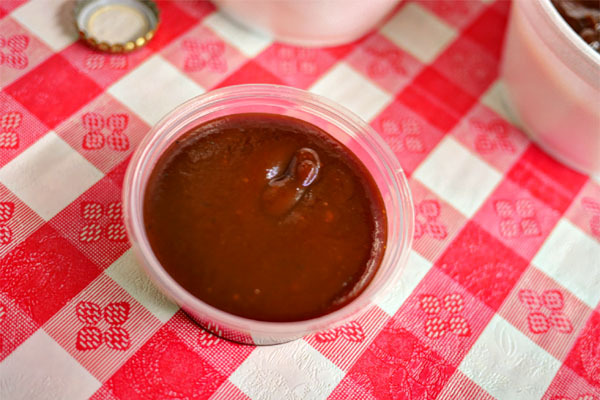 Sauces are available either slathered on the meat or on the side, and we obviously chose the latter option. Both spicy and mild versions are available, and I preferred the hot one, which conveyed a sort of sweet heat. 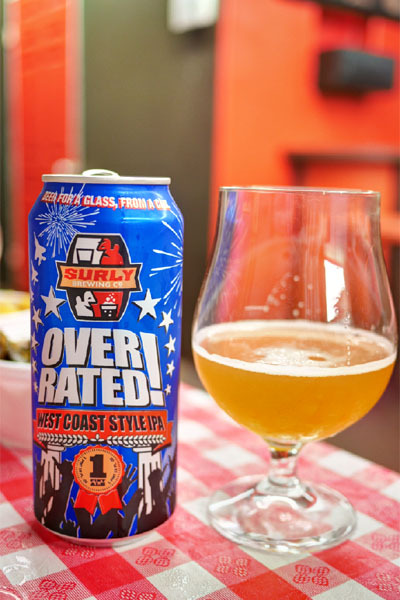 The lone IPA of the group was represented by the 2014 Surly Overrated West Coast IPA, which really did have that intense, hoppy, pine-y character that we're known for here in California. It was definitely more balanced, more nuanced in terms of taste though, and got even better after we let it breathe for a while. Our second three-item combo brought us Pulled Pork, Beef Links, Chicken Links, and sides of Mac and Cheese along with the requisite Greens. 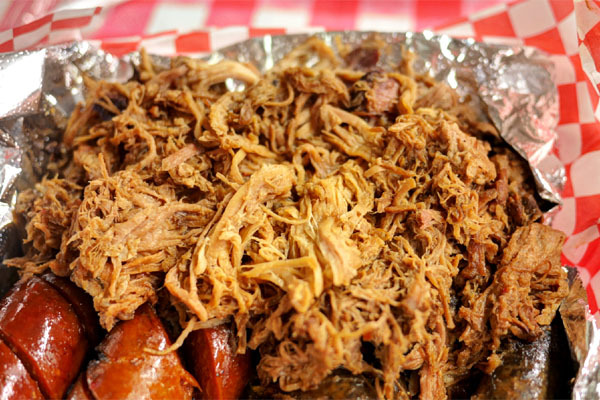 The hulking mound of pulled pork turned out to be one of the better preparations I've had. The meat was impressively juicy, and well-textured, with a subtly sweet relish that worked with all the porky flavors present. 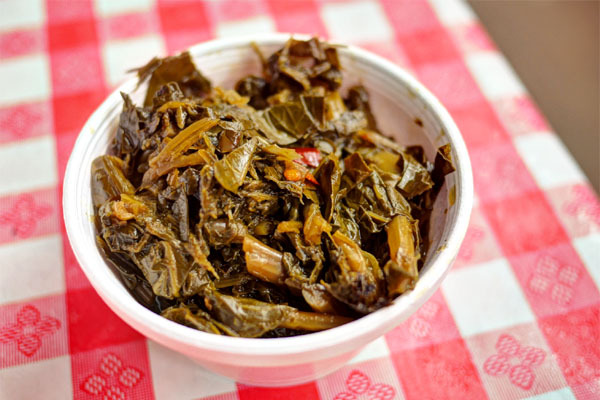 Collards were meltingly tender, with an earthy and bitter smack accented by a palpable tanginess. 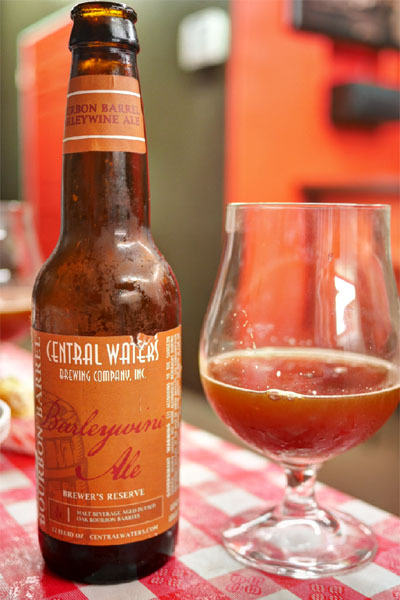 The heftiest beer of the night was certainly the 2014 Central Waters Bourbon Barrel Barleywine Ale. An American style barley wine aged in oak bourbon casks, this one was appropriately heady on the nose, showing off intense, intoxicating aromas of toffee, vanilla, and booze. In terms of taste, you got big, smooth flavors of caramel, malt, oak, some dark fruit, and more vanilla. Delish. 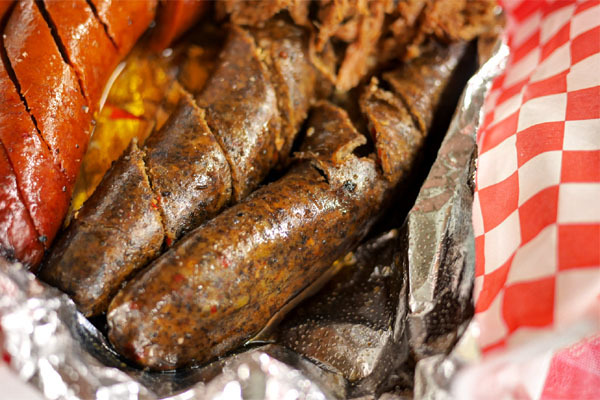 Beef sausages were what you'd expect and what you'd want: spicy and satisfying, with a suitably snappy outer casing. 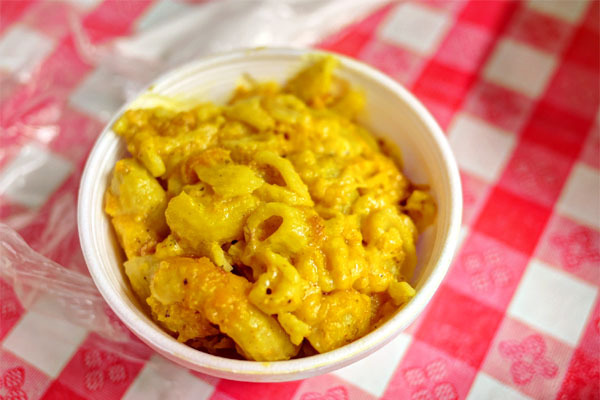 The macaroni & cheese was on the gratifying side, showing up particularly cheesy and utterly classic in its goodness. The chicken links, on the other hand, were actually more sharply spiced, with a zesty, deeply flavored quality and a grittier, more rustic consistency to boot. 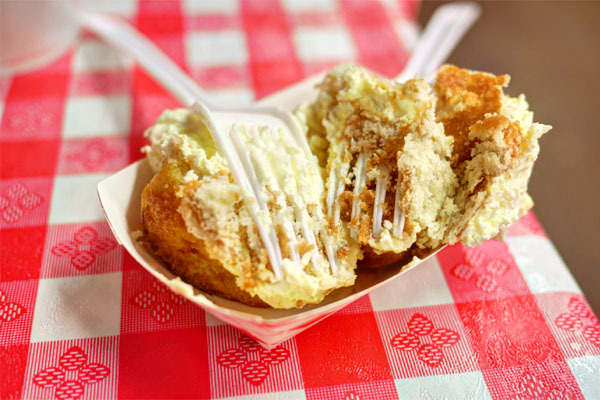 With the savories dispensed with, the kitchen sent out a complementary serving of their Golden Nuggets, a delectably creamy combination of warm cornbread and banana pudding. Yum. 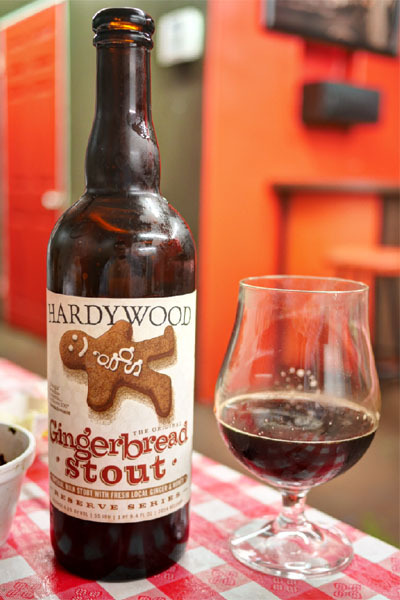 To go with dessert, we opened the 2014 Hardywood Gingerbread Stout, a limited-edition, brewery-only release from November. The velvety smooth beer really did recall the essence of its namesake, offering up a comforting mix of holiday spice flavors, ginger, and vanilla over a base of roasty stout. 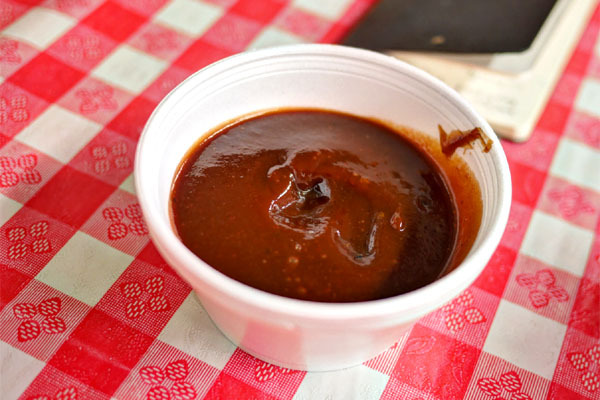 Robert Earl's claims to make BBQ so good, [it'll] make you slap mama. I'm not sure if it warrants elder abuse, but it was indeed very solid across the board, with the pulled pork, chicken, and links among our favorites. Sides were also commendable, as was dessert. Add to that the super friendly staff and clean, spacious dining area, and you've got a worthwhile barbeque experience indeed. I didn't even know about this place! 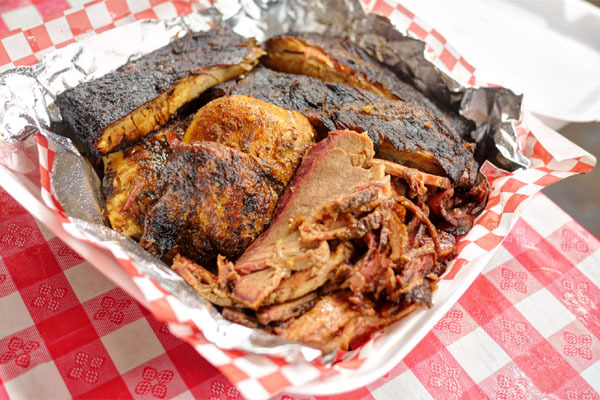 I love Porky's BBQ in San Pedro and have had them cater a number of private events for me. Are you based in the LA area?